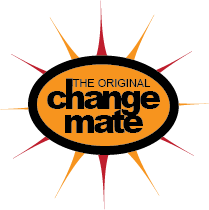 The Original Change Mate is the perfect accessory you need to get changed in public places without exposing yourself. You can use the Change Mate in many places/venues like the beach, swimming pools, gyms, dance schools and more. Use it to change in and out of clothes with ease and once you're done simply pull on the bottom drawstring, put what you have changed out of inside, pull on the top drawstring and here is your duffle bag. Sling it over your shoulder and voila!! There is even a secure pocket for your valuables. You can even use it as your bag for a day out shopping at markets where trying on a piece of clothing you really like can be tricky due to a lack of changing rooms. Simply use the Change Mate to try on what you like and then use in again in duffle bag configuration to carry home your purchases. The Change Mate really is the ultimate Portable Change Room! 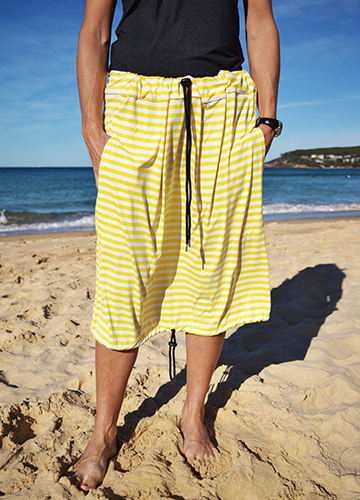 This Change Mate is made of Nylon/Lycra (like swimsuit material) is quick drying and looks on trend. Watch our video on our landing page to see how to use it!! Measurements: 75cm wide and 80cm long. It works well for adults and children. Colour: Yellow and White striped. The 2 side openings give you easy access to get changed and have been sewn in a very special way that does not allow for anybody to see what you're up to when you are getting changed. Enjoy your Change Mate and please don't forget to give us feedback. We're always looking at making our products even better. Designed in Australia and Made in Australia. Turnaround times are usually 24 hours during normal trading times. In busy times like Christmas we may experience some slight delays. Parfels should only be in transit for around 24-48 hours. This depends on your location. Please note remote areas require a longer transit time. We use Australia Post regular service. The cost for this service is $10. Please note that this method of shipping does not require a signature on receipt, We do not accept any responsibility in case your parcel is lost or damaged in transit. For registered post within Australian we offer an e-parcel $15 flat fee postage and handling service, items are trackable and require a signature or identification to be picked up. Overseas charges: $15 for regular post using Australia Post. The parcel will only be trackable once it is in your country if your country has such agreement with Australia Post. We do not accept any responsibility if the parcel is lost or damaged in transit. Our registered postage option is $29 and your order will be trackable. You will need to sign to receive the parcel.